The Psalms express the full range of human emotions – from the highest expressions of intimacy with God to the vilest expressions of violence and hatred. It’s all there. And I have always viewed the Psalms as the biblical analogue of the catharsis that the ancient Greeks sought when they participated in the performances of tragic plays. And note, I wrote “participated”, not attended. A tragic performance by Aeschylus or Sophocles or Euripides became almost a ritual experience for the ancient Greeks, a form of communal cleansing, a catharsis. Even today a performance of one of these great tragedies can be a soul-shattering experience. Therefore, how sad that only a tiny portion of the Ancient Greek tragedies have survived; most were lost forever in ancient times. Are you embarrassed by an emotion you are experiencing, or a word of hatred or jealousy that just now agitated your spirit? You will find several psalms that express what you are experiencing! Did you wake up this morning with a burst of confidence, or words of praise for God? Many psalms share your faith. Are you facing doubt and depression? Then today’s verse directs you to one of the psalms that can be the catharsis of your doubts and sadness. Only someone who runs a marathon or goes for a long hike in the summer might know what it is to pant for water. The person who wrote this psalm expresses his longing for God as a thirst similar to how a deer pants to find water in the desert of the Middle East. 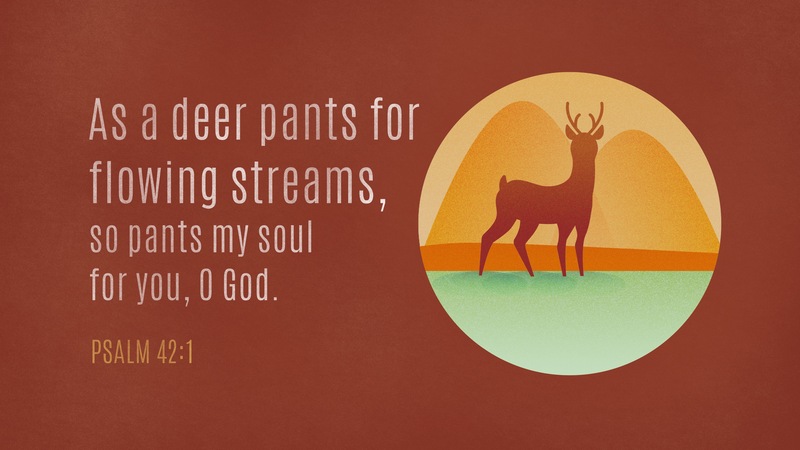 The psalmist pants for God the way a deer pants for water. That’s where faith begins, when we pant for God. But go on and read this Psalm, it is one of the most beautiful and profound. “Deep calls to deep,” the psalmist says at one point. Isn’t that what prayer should be, what our relationship with God ought to be? Not me and the “man upstairs” (a despicable trivialization of God, if you ask me) – but deep calling to deep. The human soul is deep – we are not just a bunch of neurons and cells – and God is deep, the ultimate deep! You trivialize yourself when you trivialize God; when you turn God into your drinking buddy or the vending machine in the sky. Can you see here the power of worship as part of a community? Can you see here why it is essential for each of us to participate in Liturgy? Isn’t Liturgy the closest we come as a community to experiencing what the ancient Greeks experienced at tragic festivals and what nourished the psalmist in his time of difficulty? Twice in this psalm, in the middle and at the end, the psalmist engages in self-talk, healing self-talk, reassuring self-talk. But it is not superficial psycho-babble self-talk. It is self-talk rooted in memory and trust. Categories: Bible Reflections | Tags: Psalm 42 | Permalink. Oh, my goodness, who ever said that the Bible doesn’t know how to party? And party with the most expensive foods and wines!! I can’t wait to see the full menu! And yet, this wonderful verse comes in the middle of a chapter that celebrates the defat of Moab, one of Israel’s perennial enemies. And it follows a longer chapter 24 in Isaiah that describes the devastation of the earth in language that is more dire than any climate change forecast. And not only the earth, but heaven too! Read chapter 24 and shudder at the language of destruction. I will not quote it here because I shudder at the sheer terror of the imagery. Even the wine mourns in chapter 24 (verse 7). And yet, here in chapter 25, verse 6, the Lord will feast the peoples with the finest aged wine. And note, that the promise in this verse is not reserved solely for God’s people, Israel. 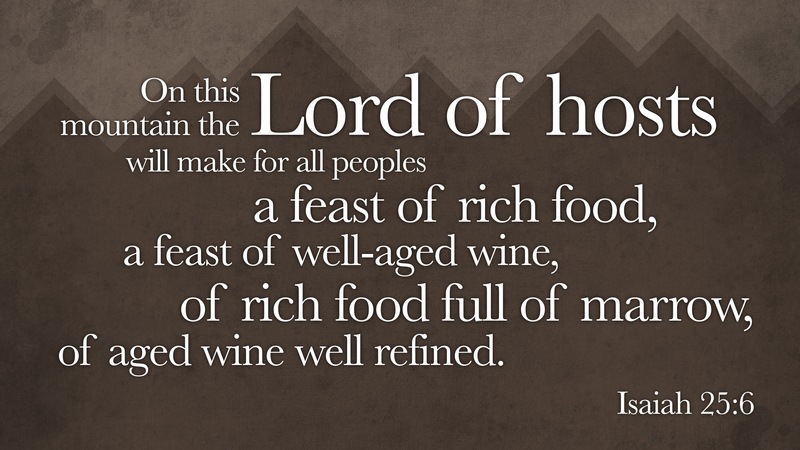 God will offer this feast of food and wine for “all peoples.” It is not unusual for the Bible to move from harsh language of judgment and destruction to language of comfort and celebration. The book of Isaiah is full of such contrasts. On this mountain the Lord of hosts will make for all peoples a feast of fat things, a feast of wine on the lees, of fat things full of marrow, of wine on the lees well refined. And he will destroy on this mountain the covering that is cast over all peoples, the veil that is spread over all nations. He will swallow up death for ever, and the Lord God will wipe away tears from all faces, and the reproach of his people he will take away from all the earth; for the Lord has spoken. What a marvelous vision, what beautiful promise! The destruction and devastation of chapter 24 is followed by this vision of healing and celebration. Yes, celebration is never absent for long from the language of the Bible. Jesus himself used images of feasts and dinners to describe heaven and the kingdom of God. Eating is the Bible’s favorite way to represent fellowship with God. And that perhaps should not surprise us, since so much of the world’s population is starving! It is not only the judgments of God that destroy, but also our sins against God’s eternal command to be good stewards of the earth and all life on it; to care for each other, to see that no one goes hungry; to share the wealth of the earth instead of hoarding it. The everlasting covenant has been broken repeatedly by human beings. But God will heal. And so in chapter 25, in the paragraph that includes today’s illustrated verse, we read: And he will destroy on this mountain the covering that is cast over all peoples, the veil that is spread over all nations. It’s like a shadow has come over the nations, that blinds us to the sufferings of others and our own destructiveness. Part of God’s healing will be to remove the cover, the veil, that blinds the nations! This is one of the most profound promises in the entire Bible, and it is one that we can all understand, especially from our vantage in the 21st century. And finally there is that promise that has come to reality in Jesus Christ: God will swallow up death and wipe away all tears from the faces of people. What else can God promise? What other incentive can God offer to create in us a desire to turn back, to return to God and our Lord Jesus Christ? May the Helper, the Comforter, the Holy Spirit, guide our steps back to the rich food and wine that waits for us. Bon appétit. Categories: Bible Reflections | Tags: Isaiah 24, Isaiah 25:6 | Permalink. Throughout his teaching and healing ministry, Jesus counseled us not to get obsessed with material things and concerns. Wasn’t that one of the messages in this morning’s Gospel parable of the Sower and the Seed? He likened the seed that falls among thorns to the man or woman who hears the word of God but is so focused on the cares and pleasures of life that the word is choked. Repeatedly Jesus taught this message. It was at the core of his healing ministry. The context of Luke 12:32 is Jesus telling us not to be anxious about material things. And he ends with the verse here represented. But the picture caption is missing two words. 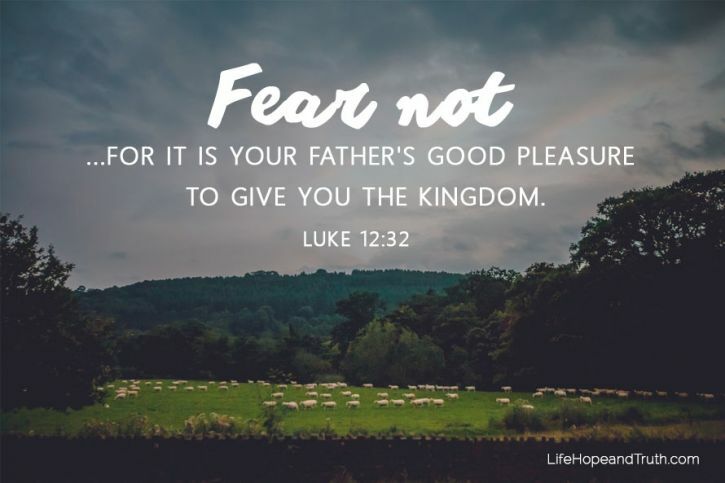 The full verse reads: “Fear not, little flock, for it is your Father’s good pleasure to give you the kingdom.” Jesus was under no illusion that only a small flock would listen to him. Today, too, his flock is small. But what a profound encouragement this verse contains for all of us, both rich and poor. Think about it. It is the Father’s “good pleasure” – in Greek, it’s one of those beautiful ευ words that I have often pointed out. God is no grudging giver; God is pleased, more than pleased, to give us the kingdom. God is happy to give us his kingdom. Are you happy to give some of what you have to bring some relief from anxiety to someone else? Can you share in God’s good pleasure? The kingdom of God arrived through the cross of Jesus Christ, on which he disarmed the powers and principalities. You are not under any foreign power or occupation. Your destiny is the kingdom, because it is the Father’s good pleasure to give it to you. So start unburdening yourself of anxieties and the power of material goods. Lighten your load as you keep on the path of righteousness and glory. And don’t be afraid. FEAR NOT, our Healer says. Categories: Bible Reflections | Tags: Colossians 2:15, Luke 12:32 | Permalink. The image in Isaiah is of a procession where the holy “vessels of the Lord” are carried. What are these vessels? Most likely, liturgical or temple vessels. Just as we today can call the communion cup a holy vessel. I’m simply writing this off the top of my head, as I don’t want this to be scholarly or thoroughly-researched; but I don’t think I’m wrong in my reading of Isaiah 52. And because Paul strategically leaves out the last part of Isaiah 52 I’m allowing myself to get a little creative now with my own reading of Paul. Consider the longer segment in 2 Corinthians, chapter 6, from which verse 17 is taken. Why is Paul writing such exclusionary words? Because “we are the temple of the living God”. And it is because we are the temple of the living God that Paul immediately then goes on quote passages of the Old Testament, “as God said.” So the way I’m reading Paul, he is taking Old Testament passages that refer to the holiness of God’s people and God’s temple, and masterfully weaves them together into the profound insight that “we are the temple of the living God”! And that is part of the reason why he leaves out the last phrase of Isaiah 52:11. Categories: Bible Reflections | Tags: 2 Corinthians 6:17, holiness, Isaiah 52:11 | Permalink. It’s two Bible verses actually, the culmination of the 8th chapter of Paul’s Letter to the Romans, a chapter truly worth reading for its extraordinary content and meaning for today. This chapter 8 of Romans, has provided me over the years with more to enrich my faith than any other chapter in the letters of Paul. Just click on the link above to go there. I love the way the slide of the two verses has been set up. The verses indeed read like a checklist of things that Paul crosses off, one by one. What amazes me is that none of these things is necessarily evil. 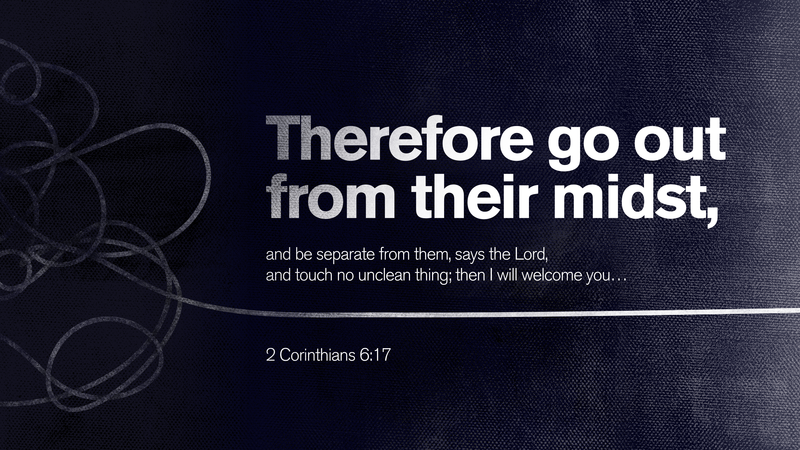 But all of them can separate us from the love of God. But how do ‘angels’ or ‘life’ or ‘things to come’ or ‘anything else in all creation’ separate us from the love of God? When they become idols! Anything can become an idol, and God’s people are experts at making idols out of good things. And the minute you create an idol, you are separating yourself from God. Notice what precedes, in verse 35: “Who shall separate us from the love of Christ? Shall tribulation, or distress, or persecution, or famine, or nakedness, or peril, or sword?” Those are the things that we would expect Paul to identify as aiming to separate us from the love of God – they are all terrible things that can easily turn us away from God and separate us from the love of God. The things itemized in verses 38-39 are not terrible things. But they can be terrible if we misuse them or turn them into idols. Angels can separate us from the love of God when we look to them more than God. Life can separate us from God if we desperately cling on to it when it is our time to let go. Death can separate us from the love of God if we die without faith or hope or love! And so on in Paul’s check list: pretty much anything can separate us from the love of God in Christ. And indeed, don’t miss the words at the end: “in Christ Jesus our Lord.” The love of God is most fully revealed in Jesus Christ. He is the conqueror of every fear in our lives. Unite yourself to Christ and nothing will ever separate you from the love of God. Paul is not saying that nothing bad will ever happen in your life. He is saying something far more powerful: Regardless of what danger you face, regardless of what fear lurks in your soul – nothing will separate you from the love of God, the love of God in Christ! It is a powerful affirmation – the Bible verse to end all Bible verses! 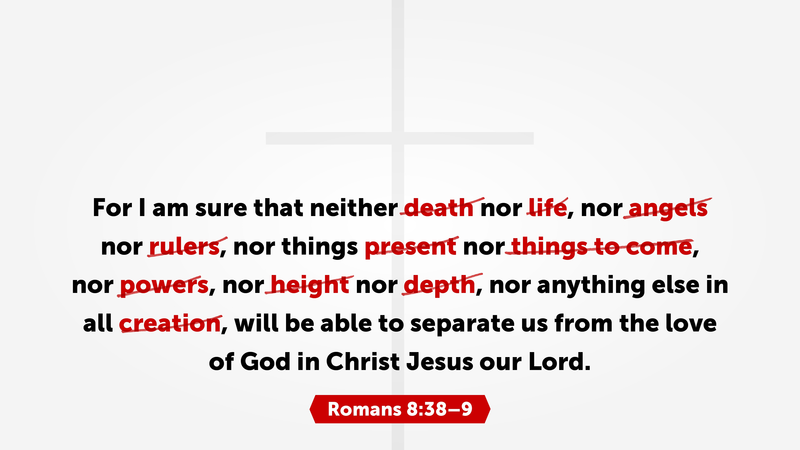 Categories: Bible Reflections | Tags: Romans 8:38-39 | Permalink. Do you live by love, or by fear? 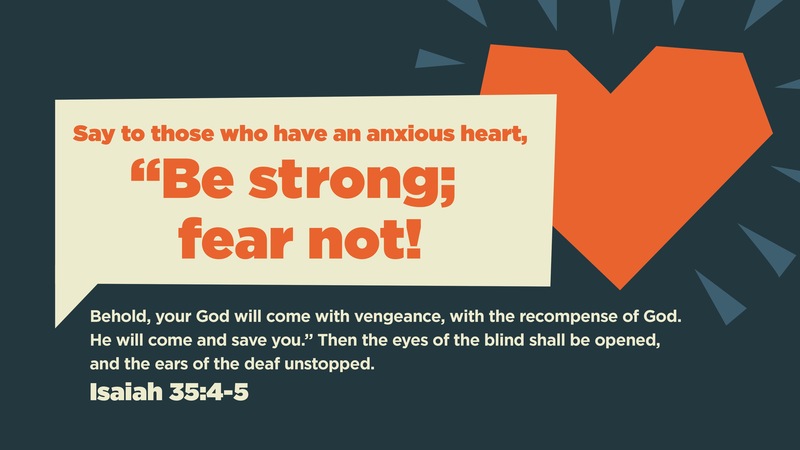 It seems that my Logos bible software is no longer putting up slides with daily Bible verses, so I have to look elsewhere for illustrated Bible verses. I’m not artistic, so I can’t create my own Bible slides. Today I choose to reflect on 1 John 4:18 φόβος οὐκ ἔστιν ἐν τῇ ἀγάπῃ, ἀλλ’ ἡ τελεία ἀγάπη ἔξω βάλλει τὸν φόβον, ὅτι ὁ φόβος κόλασιν ἔχει, ὁ δὲ φοβούμενος οὐ τετελείωται ἐν τῇ ἀγάπῃ – There is no fear in love, but perfect love casts out fear. For fear has to do with punishment, and he who fears is not perfected in love. The word κόλασιν is translated as punishment in most English versions, but it can also be more strongly translated as torment. The context of this verse is the final judgment. The sentence immediately preceding (verse 17) tells us “that we may have confidence for the day of judgment.” So it seems obvious that the fear that John refers to in verse 18 is the fear of punishment on the day of judgment. The only other place in the New Testament where the word κόλασις occurs is in the parable of the sheep and goats (Mathew 25:31-46). At the very end of the parable Jesus sends the goats to “eternal punishment” κόλασιν αἰώνιον. But in the same parable Jesus also refers to the “eternal fire” – τὸ πῦρ τὸ αἰώνιον – that awaits the devil and his angels. Because Jesus in the parable sends the goats to the eternal fire and torment/punishment of κόλασις, the word κόλασις eventually came to mean “hell”, and that is still its meaning in modern Greek. So, to go back to 1 John 4:18, fear has to do with hell and punishment. I translate the Greek, ὁ φόβος κόλασιν ἔχει, as “fear has torment in mind.” Or even, “fear has hell in mind”! But the man or woman who lives in the love of God does not live in fear. And not only fear of punishment or hell, but fear of life! Have you noticed how fearful we have become as a society? We are afraid of terrorism, afraid of hackers, afraid of immigrants, afraid of viruses – but also afraid of vaccines to prevent viruses (figure that one out!) – afraid of the food and water we consume, afraid of going out at night or walking alone, afraid of being stopped by the police, afraid, afraid, afraid… And politicians exploit these fears and magnify them with their own fear-mongering and fake news. I used to begin my morning by reading the New York Times, the Washington Post and the Guardian in order to get a good summary of real news – not the fake news pushed by others. I will continue to support and subscribe online to these newspapers, as well as our local newspaper, because I believe in the freedom of the press and the essential role that truth-telling newspapers have in a democracy. I trust these newspapers, but if the choice is between real news and fake news, I now prefer to spend more time with the good news – the good news of Jesus Christ, that is. Not that I’m sticking my head in the sand to avoid knowing what’s going on, but because reading the good news gives me a better perspective when I turn to the New York Times or the Guardian. There is a culture of fear that has grown disproportionately far beyond the real dangers out there. And fear separates us from our fellow humans. And ultimately fear separates us from God. But isn’t it strange that the parable of the sheep and goats hardly scares anyone, while we lock our doors and our hearts to the countless fears that preoccupy us? We’re not scared of God because we’ve turned God into a meaningless “higher power” or “the man upstairs” – and these are the wrong reasons for not being afraid of God. 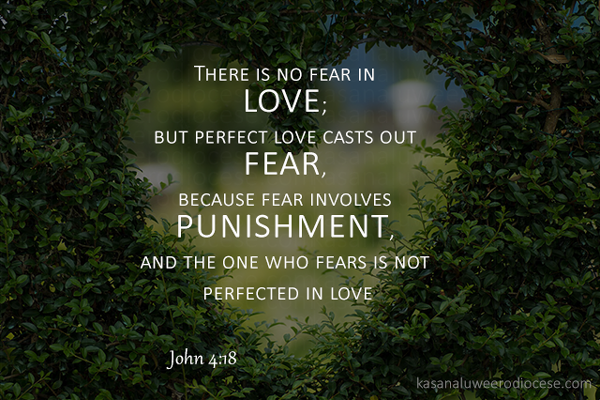 We are missing the real reason for not being afraid of God: namely, that God is love and perfect love casts out fear. And perhaps it is love that is missing in our lives, real love – love not rooted in fear or self-interest, but love as God showed love in his Son, Jesus Christ. “For God so loved the world….” Think about how love can transform your fears into rational caution rather than irrational fear of everything that moves. Now read the whole passage in the First Letter of John that explains it all, better than I can. Categories: Bible Reflections | Tags: 1 John 4:18, culture of fear, fake news, First Letter of John, good news, kolasis, parable of sheep and goats | Permalink.